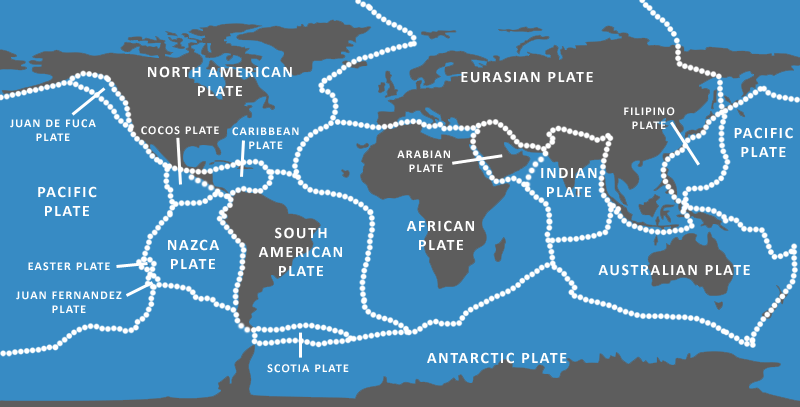 What are Tectonic Plates and Plate Tectonics? The Earth is a living planet, in more ways than one. Not only is ours the only planet known to support a biosphere, its surface structure makes it unique in the solar system. Unlike its nearest and most similar relatives, Venus and Mars, the Earth maintains a dynamic exterior, one that’s constantly shifting and renewing itself. Earth is one of four terrestrial planetary bodies in the solar system; that is, it’s primarily rocky, rather than gaseous or icy. The other terrestrial planets include Mercury, Venus, and Mars. Like all terrestrial planets, the Earth exhibits a layered structure: a central, iron-rich molten core is surrounded by a semi-rigid, semi-liquid layer called the mantle that comprises most of the planet’s thickness. A rigid, relatively thin lithosphere, or crust, floats atop the mantle. Although the lithosphere’s thickness varies, it averages about 60 miles (96 km) thick — and it’s not in one solid piece. Like a cracked shell surrounding a hardboiled egg, the crust is shattered into numerous plates of various sizes: 12-16 major plates are currently known, along with a large number of minor ones. All these plates are constantly on the move: pushing apart, sliding against one another, crashing against other plates. As early as 1596, Dutch cartographer Abraham Ortelius hypothesized that the continents might once have been joined. Francis Bacon made a similar observation in 1620. It wasn’t until 1915 however, that German meteorologist Alfred Wegener fully fleshed out the theory and outlined its implications. He noted that the coastlines of the continents seemed to fit roughly together, like a tremendous jigsaw puzzle; the east coast of South America and the west coast of Africa form one obvious example. Wegener proposed that the continents had, several hundred million years ago, been part of a massive supercontinent called Pangaea. He suggested that the continents had since drifted apart into their current positions, a supposition that was vociferously rejected by most of his contemporaries. Most such opposition was based on the fact that a mechanism for continental drift could not be found, or even conceived of. However, by the early 1960s the continental drift theory was well established, and it was determined that plate tectonics were the most likely cause. Direct observation had, by mid-century, proved that the Earth’s crust was split into free-floating plates of various sizes. Furthermore, the movement of these tectonic plates could be measured with a good degree of accuracy. Some of the plates were found to move as much as four inches (10 centimeters per year), though the rate was usually far less (for example, the North American plate tends to move about 5 centimeters per year). This is a tiny amount on an annual basis, but over millions of years, it can significantly displace the affected tectonic plates and the continents that ride upon them. As research continued, it became clear that most such movement was the result of sea-floor spreading at rifts in the Earth’s lithosphere, generally at the bases of deep oceanic trenches. The mantle is characterized by deep, slow convection currents that constantly stir the mantle material; cooler materials sink, as warmer material rises. In the rifts between tectonic plates, plumes of superheated mantle material are forced upward toward the surface. As the mantle material encounters the surface, it cools and hardens, forming new crust and pushing the plates to either side of the rift apart. The formal definition of this process is called Plate Tectonics. The word itself is derived from the Latin word tectonicus which means that which pertains to building. Plate tectonics is a widely proven and accepted scientific theory that the surface of our planet is composed of extremely large sections of mass that slowly move. These sections or “plates” essentially are colliding or sliding against each other. The study of plate tectonics has suggested that earthquakes, mountains, climate, and many other geological occurrences are directly linked to these tectonic plates. This process is so obvious that the concept of plate tectonics has since become established as one of the basics paradigms of modern geology. Tectonic plate spreading has been observed in various places throughout the world, and not just in the deep ocean beds. One spectacular example is East Africa’s Rift Valley, a huge scar in the Earth’s surface that extends from the Red Sea southeast across the continent toward Madagascar. The rift marks the juncture of the Nubian and Somalian tectonic plates, and represents the first stages of a process that will split a large chunk of East Africa off from the rest of the continent in about five million years. When tectonic plates are pushed apart in one area, something has to give elsewhere. The leading edges of the growing plates collide, and this may result in several outcomes. In some instances, one plate may grind along the edge of another, as the Pacific plate and the North American plate do at the San Andreas Fault on the west coast of North America. This repeated slip-and-catch action is the cause of many earthquakes in that area. More often, however, the heavier plate is forced under the lighter in what is called a subduction zone. Usually the oceanic plate dives beneath its continental counterpart, since oceanic plates tend to consist of denser material. As a result, the land crumples upward in mountains near the juncture of the long, slow collision. Earthquakes become common. The leading edge of the subducted plate is melted into the mantle, replenishing that layer and helping to drive its convective flow. In many cases, volcanoes roar to life on the surface above the subduction zone. An example of tectonic collision in action occurs in the Pacific Ocean’s “Ring of Fire” region. This giant ring, which generally follows the coastlines of North and South America and Asia, marks the boundaries between the huge Pacific plate and the continental plates surrounding it. Volcanoes on the Northwest coast of North America, in Kamchatka, in Japan and the Philippines, and elsewhere have sprung up as a result of collision and interaction between these tectonic plates. The Ring of Fire generates the frequent, intense earthquakes in these regions as well. Mountain chains like the Cascades, the Andes, and even the Himalayas are a direct result of the Pacific plate and other plates slamming into one another. Interestingly, many island chains, including the Hawaiian Islands and other Pacific archipelagos, owe their existence to the upwelling and seafloor spreading that give rise to tectonic collisions thousands of miles away. As the magma rises and the seafloor spreads, the islands are moved inward along the newly-created segments of the plates, leaving room for new islands to form. The Earth’s constantly shifting surface is one of the things that makes it unique among the planets of the solar system. The mantle is in constant motion, pushing hot new material up into existing rifts and driving the fragmented lithosphere in all directions. The movement of these tectonic plates and their complex interactions is the ultimate origin of much of the geological instability that occurs on the planet, including earthquakes, mountain-building, and volcanic activity. According to some sources, this may be one of the prime causes of evolution of life itself — as species scramble to survive the vast changes that result as tectonic plates collide, causing the earth to tremble, lava to flow, and volcanoes to form. This is another map that I was wondering if you had it in a PDF format that I could download & printout for my children?